During the trainings we held on Data Standard and the conversations we had with you, we realized that Data Standard could be actually summarized into a single page. And so we did it. The result is this document. 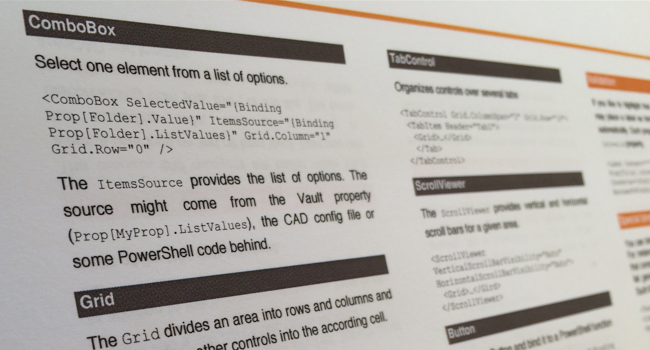 On the first page, you will find a summary of the most used WPF controls, such as Textbox, ComboBox, etc. Sure, there are more controls and also for the described controls, there are more properties, but if you know/use these, you are good to go! On the second page, you will find a short description for the Inventor and AutoCAD configuration file and a description for the PowerShell functions. The document is not a “getting started”, or tutorial or a how-to. It’s a quick reference. It’s a document you could print and leave on your desk, and pick it up whenever you can’t remember the syntax. The content is extracted from the Autodesk online help, where it is described in a broader way. This document aims to summarize all the things you must know, or all the things you usually run into while dealing with Data Standard. Finally, it also shows that Data Standard can be summarized on one page (front-rear), which says a lot!! So, we hope you will enjoy this document, and as usual, if you have comments or suggestions, just get back to us.